Sneezing, a running nose, watery eyes and itchy skin, these are some of the uncomfortable symptoms of allergic reactions. Developing an allergy as an adult can be one of the most annoying things that can happen to you. Allergies are most common in children. Most people imagine that if they did not develop allergies as kids, it’s totally impossible to develop them as adults. Can You Develop Allergies Later on in Life? If you were lucky to cruise through your childhood without developing allergies, it does not necessarily exempt you from developing allergies as an adult. It is possible for you to develop food or seasonal allergies in your adult life. Allergies are caused when the immune system identifies substances such as mold, pollen, animal dander or even food as harmful. When a substance causes an allergic reaction, it is known as an allergen. When the immune system identifies an allergen, it releases histamine which counters the effects of the allergens, and this causes allergy symptoms. Depending on the type of allergen you're exposed to, the allergy can affect your eyes, nose passage, skin, airways, sinuses or even your digestive system. The reactions you get can be severe or mild. In some cases, these allergic reactions can lead to Anaphylaxis, which can be life-threatening. Why Do You Develop Allergies as an Adult? With the answer to whether you can develop allergies as an adult, you may want to understand why and how you develop allergies in your adult life. The research on allergies and their triggers is always inconclusive. This is because allergies are different and new ones crop up each day. Can you develop allergies now that you’re an adult? Yes. However, most theories about allergies in adults focus mainly on airborne pollutant's rise in the population of dust mites, poor ventilation in the office and at home as well as sedentary lifestyle choices. The hygiene hypothesis is also another theory used to explain why people develop allergies in their adulthood. According to this theory, living in an environment that is completely hygienic can trigger allergies. This 'very sanitary' environment is harmful to the development of the immune system and makes you more susceptible to allergies. When the immune system does not have bacteria to fight, it tends to overreact to allergens. This is because the immune system only gets stronger when it is exposed to bacteria. Who Is at Risk of Developing Allergies in Their Adult Life? If you are diagnosed with allergies as an adult, there is a chance that you suffered from allergies when you were a child. Often times, allergies will follow a predictable pattern. If you had food allergies as a toddler or suffered from eczema, you are likely to develop allergies in your adult life. The allergy symptoms may have faded as you grew older but can occur again in your adult life. It is also possible to develop allergies as an adult without having a history of allergies as a toddler. 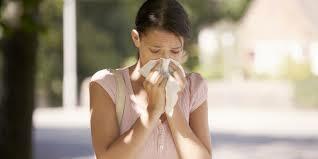 Allergic symptoms mostly start to show during your twenties, thirties, and forties. Even so, it is possible to develop allergies much later on. Allergies common in adulthood include pet allergies, hay fever, mold allergies, insect bites as well as dust mite. Food allergies can also develop. • Exposure to allergens at a time when the immune system is weak. For instance during pregnancy or an illness. • Lack of exposure to the allergen as a child and overexposure in adult life. • Moving to a new environment with different grass, trees, and plants. If you suspect that you are developing allergies, either seasonal or food-based in your adult life, it is advisable for you to first consult your general practitioner. In the meantime, you can avoid the foods or substances that trigger your allergic reaction. There are numerous allergy tests that can be done to confirm whether or not you are suffering from allergies. Blood tests can be done to test for specific allergen presence. Skin testing is also an option whereby a non-harmful amount of allergen is placed on your skin to check if there is a reaction. If your trigger is a type of food, you will be advised to use the elimination method. You are required to eliminate different foods and later slowly reintroduce them while checking whether you react to the foods. This should be done with the help of a doctor. Once your allergy triggers are confirmed, you can work closely with a therapist to reduce or completely eliminate the symptoms. Can you develop allergies as an adult? And if you do, how would you manage them? You can treat the symptoms with over the counter antihistamines. If this does not clear the symptoms, you may need to consult with a doctor. They will run a few tests to rule out other health conditions that may pose the same symptoms as allergies. You may get a referral to an allergy specialist for help. They are best placed to identify different triggers and offer advice on how you can avoid or minimize contact. If you have food allergies, you need to take it very seriously and completely avoid intake of the foods that cause allergies. Food allergies can be life-threatening. You can work closely with a food allergist who can help you identify and avoid foods that may cause the allergy. Allergy shots are also administered. These help to increase one’s tolerance to allergens. • Do not allow your pets to sleep with you. • Ensure you clean your carpets and rugs as often as possible. • Put out your houseplants. • Make use of your air conditioner. Ensure the filter is clean. This prevents pollen from entering your house. • Clean your bathroom area and kitchen area to get rid of mold. • Clean all your fluffy items. They are great breeding ground for dust mites. • Consider getting a vacuum with a filter that is HEPA-rated.